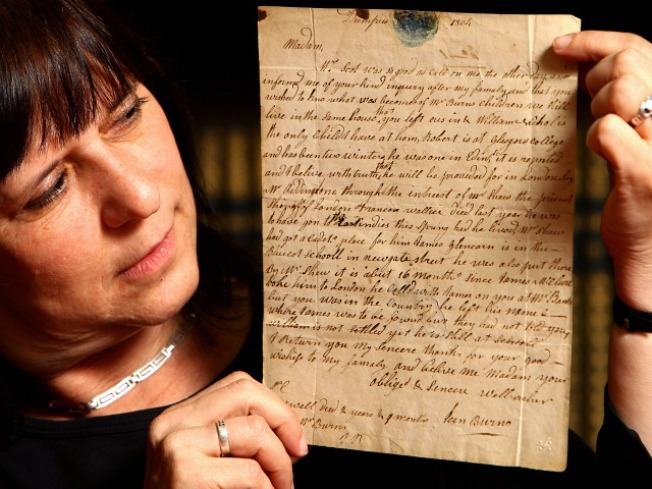 A D.C. woman found a letter written by the widow of poet Robert Burns. Yep. So today's the birthday of Robert Burns (1759-1796), national poet of Scotland, and you can just put that in the Wikipedia of your brain and leave it there alllll day. But more importantly, a local woman is delighting in the kind of shopping victory that none of us will ever, ever find. D.C.'s Dr. Nancy Grace found a letter written by Burns' widow Jean Armour in a New York junk shop. Grace paid $75 for the letter, dated 1804. Meanwhile, could any of us here tell you what the handwriting of Jean Armour looks like, much less know who she was? Nope, and nope. Today Grace is at the National Library of Scotland, and we're all just sitting around at work. Meanwhile, Scottish folk are celebrating the life of Robert Burns by eating haggis (no, thanks) and drinking whisky (yes, please).